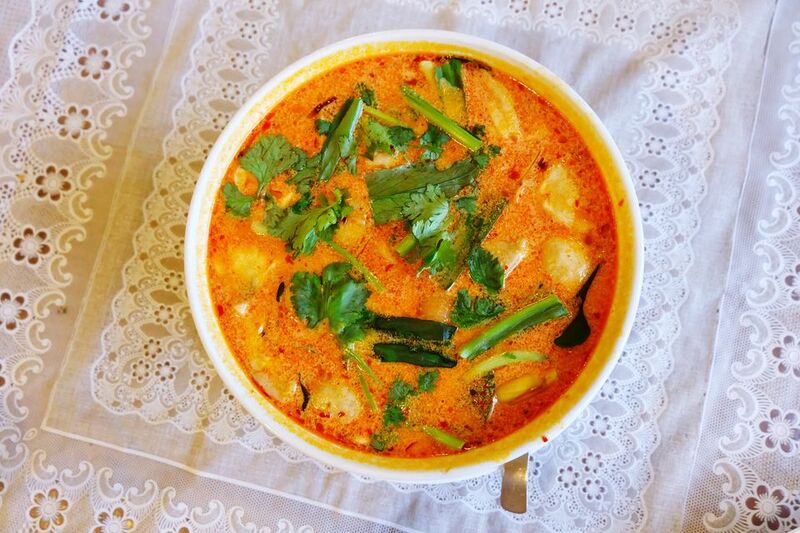 Tom Yum Soup is a traditional dish of Thailand that is usually prepared with shrimp or chicken stock and other non-vegetarian ingredients, but this version is 100% vegan and so delicious. Feel free to add other vegetables to your soup to add more nutrients and flavors; we often chop up a few broccoli crowns and toss in the broccoli florets a few minutes before I'm ready to serve the soup. In a large stockpot, heat the vegetable oil over medium-high heat. Add the minced garlic, minced ginger, and thai chilies (if using). Cook for 2 to 3 minutes, stirring often, or until the garlic smells fragrant. Add the stock, lemongrass stalks, and kaffir lime leaves. Bring the mixture to a boil, then turn down the heat, cover the pot, and simmer for 5 to 10 minutes. Using a slotted spoon, remove the lemongrass stalks and kaffir lime leaves. Add the hot chili paste, sugar, soy sauce and fresh lime juice, stirring to combine, and bring the mixture back to a boil. Add the fresh mushrooms and canned mushrooms, and cook for 2 to 3 minutes, or until the mushrooms have just slightly wilted. Turn down the heat to a simmer, then add the fresh tomato and extra firm tofu. Simmer for about 3 to 5 minutes more. Add salt or other spices as desired and serve hot with your favorite cooked noodles or rice. Garnish with fresh cilantro leaves and an extra few drops of chili paste if desired. Lemongrass stalks and kaffir limes leaves are available at Asian markets and specialty stores, but I've been able to find everything else at larger, mainstream chains.